The BillyOh Mad Dash 400 Lollipop Tower Playhouse Collection is available in four different sizes and is the ultimate kids playground. 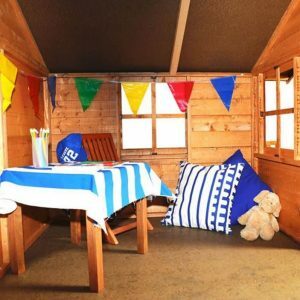 The playhouse is a good size and features saloon doors, four fixed windows and a generous amount of headroom. The tower nature of this playhouse means that your kids will love being up high and to get up to the playhouse they have a fun little ladder. There is a decking area for them to play on and there is of course the super fun slide that they can use to get down from or even up to the decking area. This is a playhouse that is all about your kids having the time of their lives, but it is also very well made. They have used some thick tongue and groove cladding and backed it up with a solid frame. This keeps the whole structure very strong and also will not allow water to get inside. Solid sheet boarding has been used for the roof and the floor and out on the decking there is some very smart looking and thick flooring that can take the kids running and jumping all over it. Safety is also a key feature of this playhouse as they have used styrene windows and a magnetic catch on the doors. The BillyOh brand never disappoint and that statement is true for the BillyOh Mad Dash 400 Lollipop Tower Playhouse. 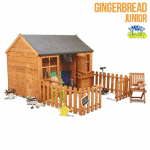 This is actually available in multiple sizes which we will touch on later, but the main meat and potatoes of this review is for the largest model of this playhouse. 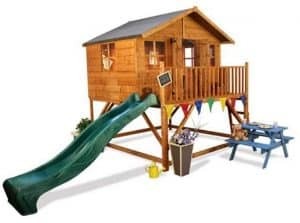 This is a tower style playhouse which all kids love as it gives them an excuse to climb. One side of the playhouse has a ladder and the other has a awesome wavy slide. There is a little decking area and even a railing that you will have to repeatedly warn them not to jump off! Plus there is the actual playhouse for them to have fun in as well. There is just so much fun to be had here. This is quite a large structure and it will take up quite a bit of space as the overall size is 7 X 14. The actual playhouse though is a decent size as well. The width is 6 feet 11 inches and the depth 4 feet 11 inches, so even just as a playhouse this is a good size. Along the ridge of the playhouse the kids will have 4 feet 10 inches of headroom. The actual whole structure though stands at just over 8 feet at its highest point. They have done a great job with the roof. We like how they have used an apex roof and feel that the overhang they have used is a very nice touch. It actually sticks out pretty far and covers most of the decking which we really like. The roof is made up with solid sheet boarding and that is then covered with some mineral felt. 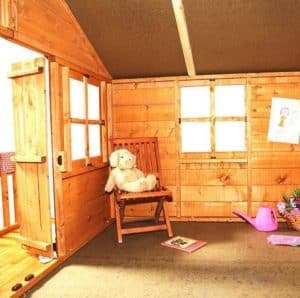 These are great materials for a playhouse at this price range and you will not have any problems with leaks or the boards showing signs of rot. As you can see from the pictures the BillyOh Mad Dash 400 Lollipop Tower Playhouse has some very smooth looking tongue and groove shiplap cladding. The way this cladding interlocks does not allow any rain inside at all. Plus, as well as being ideal from a practical point of view, the cladding also looks fantastic and gives the playhouse a bit of a cabin type look. The frame inside the playhouse is solid but not too thick and bulky so it is safe for the kids and it also helps keep the whole playhouse very strong. The framing for the tower that the playhouse and decking sit on is also very impressive and will not show any signs of weakness over the years. We know that the kids really will not have any interest in the frame. But you will feel confident in the longevity of this playhouse as the frame is very robust. On the decking area they have some very smart looking and strong tongue and groove style boarding which we really like. Kids are going to be running and jumping on here so it makes sense that they use a stronger type of flooring here. On the inside there is the same kind of solid sheet boarding that is used for the roof. While in a perfect world they would have used the same floor that is used for the decking, using this solid sheet boarding is one way they are able to offer this at such an affordable price. You will need to give the BillyOh Mad Dash 400 Lollipop Tower Playhouse a coating of wood treatment once you have installed it. The playhouse will have a basic basecoat treatment, but this is only for short term protection. A new coating on an annual basis should be applied. It really will not take you all that long and as you will have a playhouse that is rot free it is well worth it. 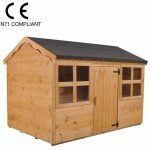 A generous five year guarantee is given with this playhouse. We have seen many playhouses that come with just a year guarantee so getting one as long as this is a very nice bonus. We just love the saloon style doors that they have used for this playhouse. It actually serves as a set of double doors so they have a ton of room to get in and out of the playhouse. A magnetic catch makes the doors very easy for the kids to open, but they will not flap open and closed in the wind. We really love the design and it is something that we have not seen many other playhouses do. The BillyOh Mad Dash 400 Lollipop Tower Playhouse has four fixed styrene windows. There are two on the front and one on each of the sides. There is going to be plenty of natural night getting into the playhouse and that is something we really like. While we do like the windows, we feel that a small window on each of the saloon doors would have been a great addition. The magnetic catch that keeps the doors closed is designed to keep the doors shut so it is quite a secure playhouse. Honestly we do not have any issues with the security and feel it offers just as much security as the other girls playhouses we have seen. 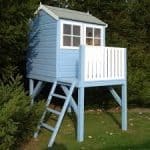 As this is a tower playhouse the windows are at head height so there is not much in the way of privacy on offer with this playhouse. But if this is a concern of yours or if the kids just do not want you staring at them as they play, you can always use some fabric, blinds or curtains. The BillyOh brand is one of the best when it comes to customisation. 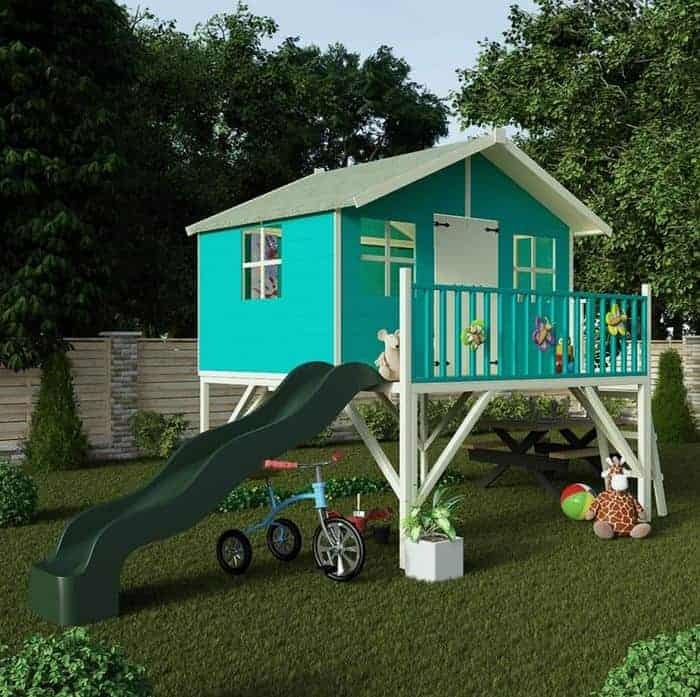 They have a number of different colours that you can have the trim or the actual playhouse in. The trims will cost you £7.99, whereas the paint for the playhouse will cost you £12.99. As well as this the slide can be a different colour. 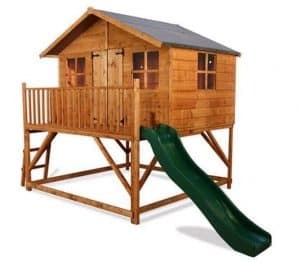 The standard green slide is part of the actual playhouse, but you can upgrade it to a slightly larger and different coloured slide for an extra £9.99. 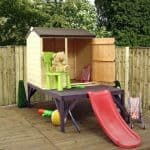 This playhouse can actually be purchased in four different sizes and the one we have reviewed is the 7 X 14. 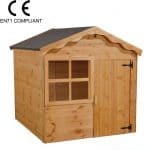 But this model of playhouse is also available in 7 X 12 for £329. This version comes with all that you get with the 7 X 14, but is just a little smaller. There are two more compact versions of this playhouse. 7 X 8 at a price of £379, yes this is for some reason priced higher than the 7 X 12 version and it does not come with a slide! The smallest version is the 7 X 6 model at a cost of £299. This version though does not include the slide as standard. For the price this is one very high quality playhouse. Sure we would have preferred tongue and groove boarding be used for inside the playhouse, but in general this is a very impressive playhouse. This is one very solid playhouse that as long as you treat it on an annual basis will not show any signs of rot. We are confident that this is going to last your kids as long as they can fit inside of it. This can be purchased in four different sizes and no matter the size of your garden we are sure that one of the sizes will be perfect for you. This is most certainly a two person job and with it being so high it may be a little awkward so it is best to put aside a full day to install this. 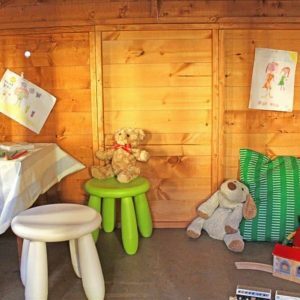 Even the most expensive version of this playhouse at £400 is great value for money. 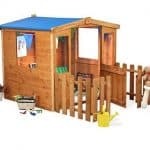 We feel that all the versions of this playhouse are fairly priced and even if you do have to pay an extra £10 to add a slide to the smaller models it is still a good price. Final Thoughts: The BillyOh Mad Dash 400 Lollipop Tower Playhouse is the kind of playhouse that we wish we had when we were kids. No matter what size you purchase it in, the kids are going to have an awesome time. Climbing the ladder, going down the slide, playing in the playhouse and being told off for jumping off the decking are all things they are going to be doing. The price we feel is very fair and the materials used are probably the best they could use and still keep the price so affordable. If you want something more than just a standard playhouse then this is one that we highly recommend you consider.